Project 1 Flocculation: Flocculation is a major process controlling the transport of cohesive sediments in estuaries and allows sediment to carry organic carbon and pollutants. A summer intern will work with UD researchers to carry out laboratory experiments on flocculation processes for cohesive sediment interacting with beach sand and organic matters (e.g., transparent exopolymer particle) and to quantify the resulting settling flux using a video camera system and microscope. Machine learning (ML) techniques will be use to model floc settling with a wide range of variables, including turbulence, particle concentrations, particle properties (size, density, shape, stickiness). Project 2 Barrier Islands: Low barrier islands are vulnerable to wave overwash and breaching by storm surge and waves. The low-lying western section of Dauphin Island, Alabama was completely overwashed during Hurricane Katrina in 2005. A 2-km wide channel was cut through a segment of this undeveloped section. A channel breached during a storm may be deepened and widened by tidal currents in the channel after, the storm. A rock seawall may be constructed across the breached channel to reduce currents in the channel and halt or reverse the expansion of the channel cross-section. Laboratory experiments are conducted in a wave channel (30-m long, 2.5-m wide and 1.5-m high). 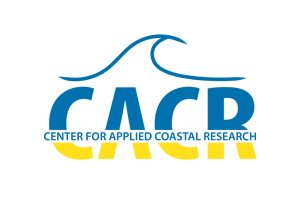 The experimental data will be used to develop a design method for a rock seawall and to calibrate the existing numerical model CSHORE for predicting sand transport in the breached channel without and with a rock seawall. Project 3 Dune Erosion: Dunes are often the last barrier to flooding and inundation under extreme events. Scientists and engineers are interested in understanding how dunes evolve during extreme forcing and to determine the importance of vegetation and sediment compaction in dune response. Data during extreme events on natural beaches are scarce and difficult to obtain. The project focuses on dune erosion studies in a large-scale wave flume to quantify erosion rates and processes and provide necessary information for process-based predictive models and engineering-based fragility analysis. Project 4 Ship Wakes: Navigation channels are often contained by low-lying areas and vegetated wetlands. The fetch for natural wave generation may be small. However, vessel traffic generates ship wakes that can negatively impact the shorelines. This project focuses use of the state-of-the-art ship-wake computing software, FUNWAVE-TVD, to conduct ship-wake simulations and analysis using field data from Pea Patch Island, DE. Some additional field data collection may be required as part of this project. Applications must be received no later than March 15, 2018.